The celexon 81“ Manual Pull Down Projector Screen Professional Plus is part of the new Professional Plus Series which offers a good price/performance combination. This manual pull down screen is perfect for use in conference or meeting rooms or for home cinema use. The 3-ply projection fabric consists of a stabilizing polyster layer in the middle, a black back and a matt white viewing area. Its gain factor is 1.2 and the screen can be used in most projection environments. Due to the gear-driven soft-return mechanism, this manual pull down screen is longlasting and ensures a constant retraction force. 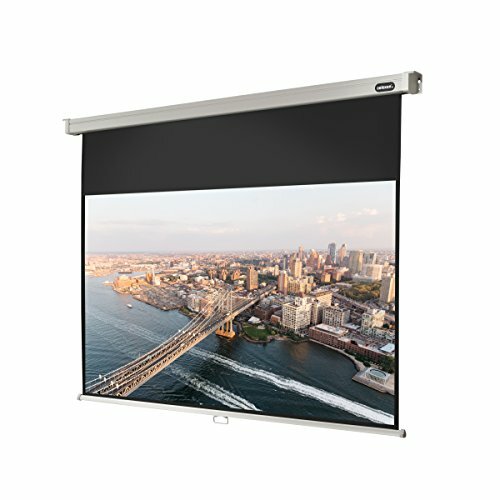 The pull down projector screen is provided with a black border to achieve optimal image containment and increased contrast of the projected image. The black backing is impervious to light, making it possible to be mounted in front of a window, without any light passing through. The screen can be locked every 10cm, making it possible to achieve different formats/viewing area heights. Also included are mounting caps for wall or ceiling and an installation and operating manual. Wall spacers are sold seperately.